Whether you need emergency hot water tank or tankless water heater repairs, replacement or new installation, A Better Way Plumbing & Heating can help. We’ll help you choose the best hot water tanks and tankless water heaters for your budget and family usage needs. There is no point in paying for more than you need. 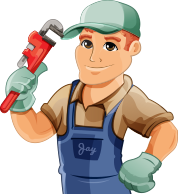 One of our expert plumbers will gladly inspect your old hot water tank and provide honest consultation on whether repair or replacement is your best option. We’re happy to answer any questions you may have. Many new hot water tanks have self-cleaning capabilities which reduces sediment, lime and calcium buildup thereby increasing efficiency and extending the life of the tank. On gas hot water tanks, automatic shut-off valves will stop the flow of gas in the event of a gas line rupture. When using a lot of hot water in your home, the speed at which your tank can replenish your hot water is important. If you are expecting high usage, consider the recovery speed in your choice of which hot water tank to purchase. There are a lot of factors to consider when replacing a hot water tank. Our plumbing experts at A Better Way will be happy to answer any questions you may have, whether it’s a gas or electric hot water tank or a tankless water heater. Visit our contact page to send us an email or give us call a. 403-667-5862. We’ll make sure you choose the right type and size for your family’s needs.